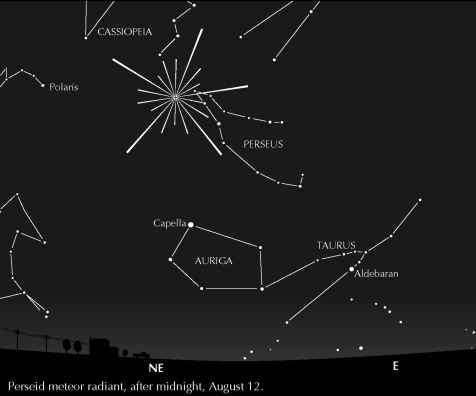 Just before dawn in early June, a tiny dipper-shaped group of stars in Taurus can be seen shining faintly through the strong twilight. This event is the 'helical rising' of the Pleiades, the cluster's first appearance after coming from behind the Sun. 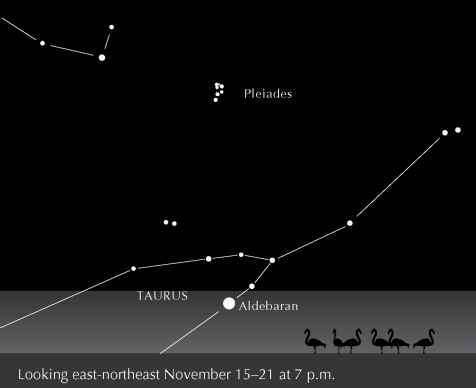 For the rest of the year, the Pleiades rise earlier each day, mounting ever higher in the sky until this week, when they rise as the Sun sets and are in the sky all night. Look toward the east after sunset to see this distinctive nest of stars glimmering among the trees. The annual appearance, culmination, and disappearance (helical setting) of the Pleiades was used to establish important religious and agricultural dates for many cultures, including the ancient Maya and Aztecs in Mexico, and the Pueblos in the southwestern U.S. The Navajo revered the Pleiades as father and creator of the world. The name most frequently associated with this cluster is the Seven Sisters, although only six stars are generally visible to the naked eye. The story goes that one of the sisters married a mere mortal and for this reason shines less brightly than her sisters. The cluster's appearance in early November reminds those in the southern U.S. of the coming of winter (cold weather has, no doubt, already arrived for those in northern climes). In binoculars, the Pleiades nexus appears like diamond chips on black velvet. The entire group is clumped within an apparent area about one and a half degrees - three times the diameter of the full Moon - so the high magnification and limited field of view of a telescope won't show you the entire setting of this group. Astronomers have cataloged several hundred members scattered in and around the Pleiades. As star lives are measured, astronomers believe the cluster is comparatively young, a few hundred million years old. Recent research even suggests that some star birth is ongoing in the Pleiades. Today, people idly scanning the starry sky will pause upon the Pleiades and remark how lovely it looks. Little do they know they are looking at a celestial hallmark that was woven into the fabric of the lives of many ancient civilizations. As direct or indirect descendents of those civilizations, the Pleiades cluster appeals to that primal level in our brains that harkens back to a past still encoded in our genes.